Powerful steroid of anabolic (400% of testosterone) and androgenic (200% of testosterone) effects. The main active ingredient – Trebolone. 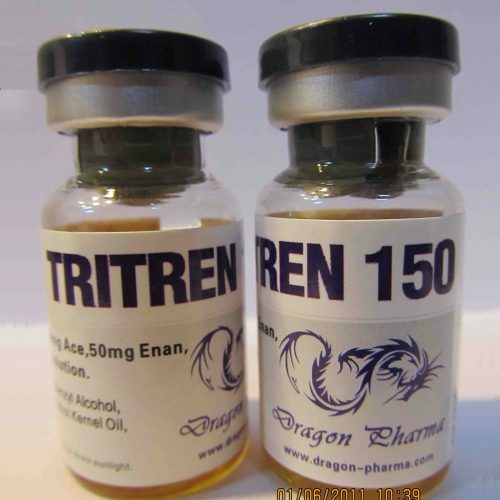 TriTren 150 from Dragon Pharma – a mixture of esterified derivatives – trenbolone acetate, trenbolone enanthate and trenbolone hexahydrobenzylcarbonate. The main difference of mix is its long-term exposure, which ensures a gradual splitting of esters and prolonged intake of the active substance in the blood. 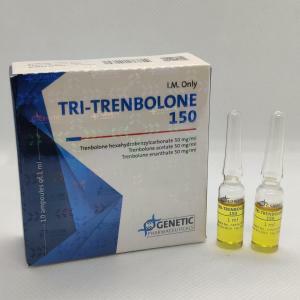 Addition of Acetate to the mixture provides a peak concentration of trenbolone in the blood, almost immediately after injection. The second splits Enanthate (approximately 10 days), and the last – Hexahydrobenzylcarbonate (12 days). Tri Tren 150 first appeared on the market in 2004, and soon began to forge the drug. In this regard, the company Dragon Pharma was forced to take to protect its production measures: the last pariah goods have a special secret code by which through the official website you can check the originality of the steroid. Increase in muscle mass. 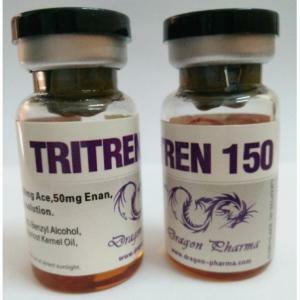 TriTren 150 is the strongest anabolic steroid, with a two-month cycle, you can gain up to 10 kilograms. Increasing the level of insulin-like growth factor. Lowering blood concentration of cortisol. Increase libido on the course. TriTren 150 has no analogues in its anabolic effect. It is so powerful that for building mass is almost always used solo. The downside is the high probability of side effects, especially at higher doses and longer cycles. Before the start of steroid use, is recommended to consult a doctor. TriTren 150 dosage is calculated on the basis of pharmacological athlete experience, his individual performance and sports purposes. Recommended dosages range from 200 to 500 milligrams per week. In order to avoid “holes hormonal”, it is best to divide the dose into two injections. For beginners, this mix – not the best choice. As a first cycle of trenbolone is recommended to use a separate ester – for example, Acetate. How to use the TriTren 150 in combination with other AAS? In fact, the options are many. Classical stacks are trenbolone with testosterone, stanozolol and methandrostenolone. For women, use of this drug is extremely dangerous. Exceeding recommended dosages often leads to negative reactions. Side effects from TriTren 150 are the following: high blood pressure, acne, hair loss, decreased libido, testicular atrophy. The red color of urine is often determined by the athletes as a sign of kidney damage, but in fact it is called derivable metabolites. The drug has no effect on the state of liver enzymes if taken in moderate dosages. 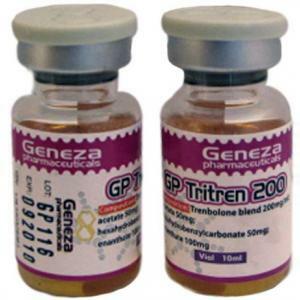 Athletes remark the usability of trenbolone blend. Reduced injection frequency allows to avoid the formation of “lumps” at the injection site. 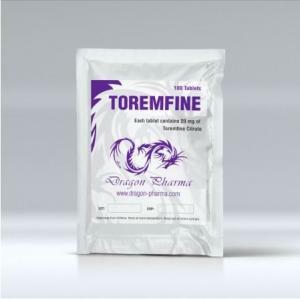 Reviews of TriTren 150 from Dragon Pharma are said to increase athletic performance, endurance and muscle volume during the cycle of preparation. Moreover, most people are able to significantly reduce the percentage of body fat. Reviews of TriTren 150 by women can not be found (steroid use is impractical because of the high probability of virilization).